We need God in our country & our lives. Today I have 2 postings, prayer for a fellow blogger and now this one. I wanted to share this with you all because I was so deeply moved when I saw in Dallas, TX while visiting a relative; this was in the back of an 18 wheeler. I know that prayer has been taken out of our schools and some people want to take “In God we Trust” from our money. I know there are a lot of folks that don’t believe in God for whatever reason but even for those people who don’t believe; He still died for them because He loves us. What an awesome God we have. This entry was posted in Journey and tagged Christian, Christianity, Faith, family, God, Healing, Jesus, journal, prayer, Relationships, Salvation. Bookmark the permalink. A great comment – but how does it look in practice? How would Jesus want us to deal with the poverty, injustice, prejudice and the other areas of brokenness in society? Why is the church so ineffective in sharing the gospel? Is it that our lives that need radical change too? You raise great questions, I can’t answer them but I can say that we as a society have become tolerable of ungodly things because our government has passed laws that are in conflict with God’s laws/principles. What can we do to make sure that we are in line with God’s word? Thanks so much for following my blog. I’m now following your as well. 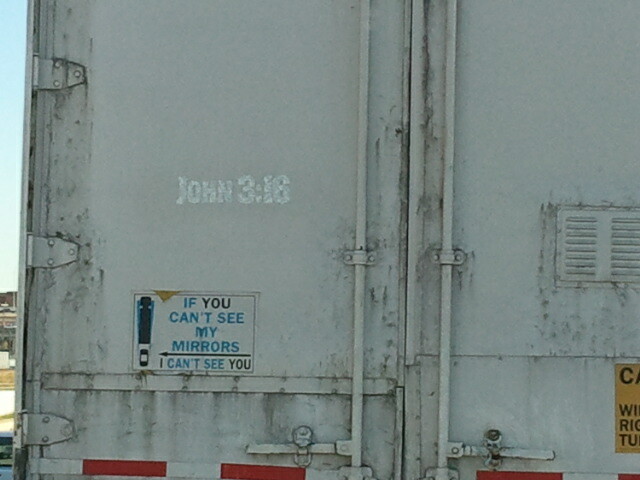 I enjoyed the pic of John 3:16 on the truck. I have some friends in Dallas who are all about prayer and they regularly engage (not only in Dallas, but in other cities as well) people in the community in prayer and talking about Jesus. This week a group of them and others from around the country are in Ashville, NC praying. Praise God, I am elated to hear you say that. We need God in our country, always.